"Deathwing." Steve and Brandy mourn the loss of their friend, a police officer named Artie, as Rom looks on. Steve rages against Rom, blaming him and once again entertaining doubts about the Wraiths, but Rom tells the story of another world destroyed by the Wraiths, and warns that this could be Earth's fate. Then with his Analyzer, Rom determines Artie is alive, so he departs, and Brandy and Steve let in the rest of her lab, so that Artie can be taken care of. Rom uses his Analyzer to track Wraiths, and finds them pretending to have a funeral for one of their own. In the mean time, a mysterious reptilian creature seems to be hunting the other Wraiths in Clairton. 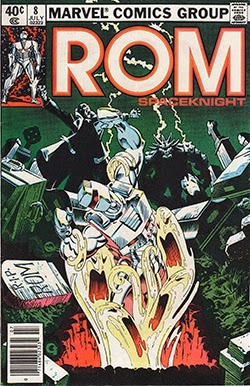 Rom arrives at the grave yard and attacks the Wraiths. Their leader summons a Deathwing, but the creature is hard to control, and ends up turning on him and killing him. Rom's arm is touched by the creature, and he loses control of it, falling into the grave, and then down into a deeper pit. The monster hunting Wraiths appears, and is revealed to be Serpentyne. Story - 4/5: This is another strong installment from writer Bill Mantlo. Rom, Brandy, and Steve are still locked in the lab where Brandy works, with the dead remains of the sentient plant that attacked them last issue. Artie, Steve's friend, lies seemingly dead, and Steve is distraught. He takes his grief out on Rom, once again questioning the Spaceknight's stated purpose. He doesn't question the presence of the Wraiths, but he questions whether Rom's story -- that the Wraiths are evil and dangerous -- is truthful. They've been here for years, Steve argues, and no one has gotten hurt until Rom came along. Steve's grief is understandable, and on the surface, he seems to be right. The Wraiths are taking overt action now, and killing humans more freely, in their desperation to eliminate Rom, the greatest of the Spaceknights and a clear threat to their plans. However, what the reader knows, but Steve Jackson doesn't, is that even without Rom around as a threat, the Wraiths are cruel, evil, and murderous. We have seen what they did to Archie Stryker, and to other humans. Rom tries to calm Steve down, but in the end, as Brandy's co-workers keep hammering on the door to be let in, he finally departs. His analyzer shows that Artie is still alive, so Brandy and Steve need to let everyone else in to save Artie's life. Rom, in the mean time, heads off to find his Neutralizer. As Rom searches, there is an interesting one-page interlude involving the Clairton Coroner, who is only known to us by his first name, Silas. Silas has looked into the records of everyone killed by Rom so far, and he has noticed something fishy: all of them were born on the exact same day. That can't be a coincidence, and he writes it up in a report to the FBI. One of the cops, Andrew, volunteers to drive it down to D.C. for him, but Andrew is a Wraith. He realizes that the records goof is a major problem, and is going to warn his superiors. However, as he leaves the office, a dark reptilian shape comes out of the shadows and kills him. Silas later finds his papers abandoned on the street, and decides to take them in himself. This is a very interesting development that, having read future issues, I know will come into play. The Wraiths will eventually be revealed as having arrived on Earth in the late 1940s, shortly after World War II. In the confusion of the mass migrations after the war, with so many normal humans having been displaced and chosen to leave their homes for other, safer countries, the Wraiths were easily able to infiltrate themselves into our society. This is how they did it, and it was all done at the same time -- on that one day when all their records claim they were born. As the story concludes, Rom attacks the Wraiths at a funeral, and one of them summons the Deathwing. We have seen this creature once or twice before, but this is the first time it has gone after Rom since he has come to Earth. We know it has the power to extract energy and life-force from people. Rom grabs the Wraith sorcerer who summoned the Deathwing and offers him up to the creature as bait, and the creature takes the Wraith -- Deathwings do not care whom they feed on. But Rom's arm is grazed by the 'wing, and that is enough to knock him out. He falls into the grave, which gives way to a deeper pit. The reptilian creature from before shows up, and is revealed to be Serpentyne, and the pit is his lair. The stage is set for a fight between him and Rom next issue. Overall, this is a good story, although I confess that I am not enough up on the Marvel Universe to have ever heard of Serpentyne before. From the way he is presented on the final page, the creative team presumably expects the reader to be recognize him and be suitably awed and surprised. To me it is not a very exciting moment, simply because I know nothing about him. But other than this, the issue is interesting and it moves the story forward significantly. We continue to get good "screen time" out of our two major supporting characters, Brandy and Steve. Mantlo continues to reveal more about these characters as time goes on. And we see that even without his neutralizer, Rom is a formidable enemy to the Wraiths. Art - 5/4: Sal Buscema's art continues to be excellent. His layouts are creative without making a huge fuss about it. His action shots are kinetic and exciting as always. And his full-page spread of the Deathwing attacking Rom is gorgeous. I love the shape of the Deathwing... it is evil and alien looking, but still familiar enough to know what we are looking at. Cover - 3/4: The cover is once again this issues weak point. It is uncredited, so I can't say for sure who draw it. Rom looks too skinny, and his eyes are not drawn correctly. The spirits that are pulling Rom into the grave are reasonably well done, but of course this is not what actually happened in the story. Overall Experience - 4/5: Overall, this is another strong issue. The story moves forward nicely, and the artwork is again of high caliber. Mantlo and Buscema continue to show us how it's done -- this is how to produce a top-notch comic-book in the classic Bronze Age style.